The rules will be updated after the Olympics in 2012. There are constant changes to the rules that occur to try to improve and fix things that don't work. And to fix the unintended consequences of previous changes to the rules. Since there were wholesale changes to Section C - At marks and Obstructions in the last cycle, the ISAF working party on Section C that was responsible for the current rules, is still at work trying to improve the rules in this section of the rule book. What follows are the submissions of the that might make it into the next version of rules. ISAF will be voting on these and other proposed changes to the rules in November 2011. However, mark-room does not include room for a boat to tack unless she is overlapped inside and to windward of the boat required to give her mark-room and she would be fetching the mark after her tack. Mark-Room Room for a boat to sail to the mark, and then room to sail her proper course while at the mark. However, mark-room does not include room to tack unless the boat is overlapped to windward and on the inside of the boat required to give mark-room. 1. The current definition includes room to sail to the mark when the mark is a passing or finishing mark that is nowhere near the boat's proper course. That provision is unnecessary, and gives the boat entitled to mark-room more power than she needs to pass the mark in a seamanlike way. The proposed definition removes this flaw. 2. The word "at" in the current definition and the change of rights during the transition from "to" to "at" the mark have caused difficulties in interpretation. The proposed definition does not use "at" terminology and avoids the “to” to “at” transition. It replaces these by rights that depend on a boat's proper course and the rounding necessary to sail the course. This is easier to judge, less ambiguous, and takes other boats into account. 3. The current definition grants room to sail a proper course while at the mark, which is a broader right than is needed for orderly mark roundings. Under the proposed definition, the right of the boat that has mark-room is always to sail a seamanlike course (to or round the mark). 4. The current definition's provision for room to tack can be interpreted to give rights to tack in situations where the tack is not to fetch the mark, which was not intended. The proposed definition clarifies when that provision should apply. 5. 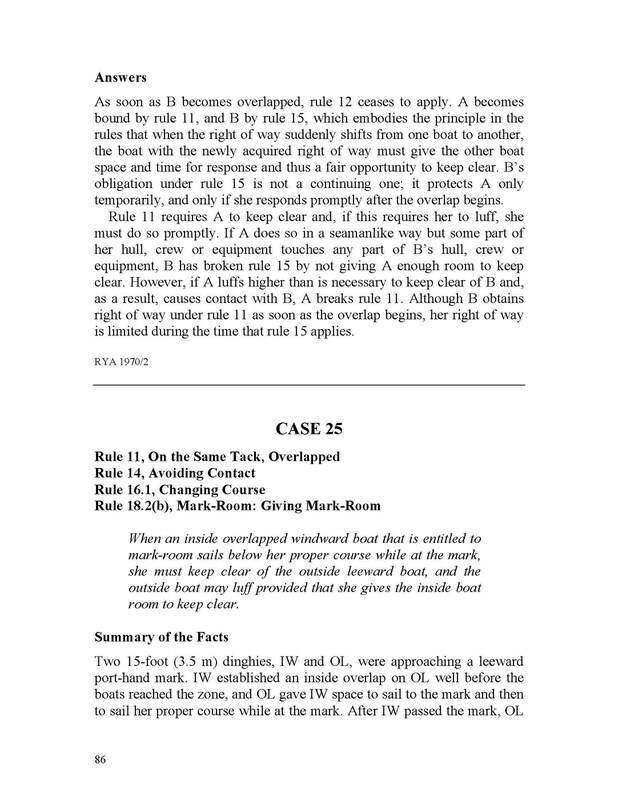 Because of 1 and 2 above, an extra rule 18.2(c)(2), covering the situation when a boat required to give mark-room establishes an inside overlap, is proposed in a separate submission. That separate submission is integral to this submission. Keep Clear One boat keeps clear of another if the other can sail her course with no need to take avoiding action and, when the boats are overlapped on the same tack, if the leeward boat can change course in both directions without immediately making contact with the windward boat. When two same tack boats are sailing alongside each other, the windward boat must give space, commonly known as "wriggle room", for the leeward boat to change course both towards her and away from her. In the same circumstances it is logical, consistent and has safety advantages to allow the same space to a starboard tack boat sailing downwind alongside a port tack boat. Proper Course A course a boat would sail to complete the course and finish as soon as possible in the absence of the other boats referred to in the rule using the term. A boat has no proper course before her starting signal. The current definition does not define ‘proper course’ in the way that competitors use the term. The proposal aligns the wording with what competitors think the definition currently says – that is, a proper course is one a boat would sail to complete the course and then cross the finishing line as soon as possible, in the absence of other boats referred to in the rule. The problem with the current definition is that ‘finish’ is a defined term that makes no reference to sailing the course, only to crossing the finishing line from the direction of the last mark. Strictly speaking, a boat’s proper course under the current definition is to sail directly to the finishing line without completing the course. Adding the words ‘complete the course and’ brings the definition into agreement with current usage of the term among competitors. The preamble’s current first sentence can be interpreted to mean that, when Boat A is required to keep clear of Boat B, B has right of way over all other boats. The intended meaning is that, when A is required to keep clear of B, B has right of way over A. The proposal states clearly what is intended. (b) shall be exonerated if she breaks this rule and the contact does not cause damage or injury. Replacing "shall not be penalised" with "shall be exonerated" simplifies the rule and makes it consistent with the principle that a boat breaking a rule shall be exonerated or penalized. them. When rule 20 applies, rules 18 and 19 do not. (d) From the time a boat hails until she has tacked and avoided the hailed boat, rule 18.2 does not apply between them. The current rule does not clearly limit itself to interactions between the hailed and hailing boats, which raises the possibility that rules 18 and 19 can be unintentionally dis-applied with respect to another neighboring boat. It is also not clear when rule 20 starts and ceases to apply. The proposed language clarifies both questions. There is no need to “switch off” rule 19 when rule 20 applies. A boat hailing at an obstruction under rule 20 is either leeward or clear ahead of the hailed boat. Because she has right-of-way, rule 19.2(a) gives her the right to choose to pass the obstruction by tacking. This resolves the common situation where two port-tack boats approach a starboard-tack boat: the windward port tack boat’s claim to room under rule 19 to pass to leeward of the starboard-tack boat is invalidated when the leeward boat chooses to tack. This is exactly what is needed. Therefore rule 19 should apply when rule 20 applies. It is also essential that rule 19 does apply in some rule 20 scenarios when there is more than one obstruction. Rule 20 can come into conflict with rule 18.2 when a port-tack hailing boat needs room to tack and avoid a starboard-tack boat inside the zone. If the hailed boat has mark-room because she is the inside boat the rules must, for safety, give priority to the hailing boat’s need to tack over her obligation to give mark-room. The proposed rule makes this clear. There are no conflicts between rule 20 and other parts of rule 18. In fact it is desirable that rule 18.3 is clearly in force, as situations at windward marks involving rule 20 often also involve rule 18.3. Preambles are less often read than rules. Placing this sentence within the rule where it arises will make Section C simple and easier to understand. The proposed rule will not arise unless rule 20 is part of the incident, so sailors will find this exception to rule 18 when they need it. However, if the boat entitled to mark-room passes head to wind or leaves the zone, rule 18.2(b) ceases to apply. (e) If a boat obtained an inside overlap from clear astern or by tacking to windward of the other boat and, from the time the overlap began, the outside boat has been unable to give mark-room, she is not required to give it. The new rule18.2(c)(2) prevents a boat required to give mark-room from acquiring any rights or obstructing the boat entitled to mark-room if she becomes inside the other boat. It also puts a limit on the action that the boat entitled to mark-room may take when the boat required to give mark-room attempts to take advantage of space left between her and the mark by the boat entitled to mark-room. The (1)(2) sub-division of rule 18.2(c) is added to make the rule easier to read. * The rule can only apply when rule 18.2(b) applies as the first line is specific to that rule; therefore it is not necessary to turn off 18.2(c) in the last line. The extra words at the end of the first line of rule 18.2(e) address scenarios when a boat tacks inside at a windward mark, after passing either in front of or behind the other boat. 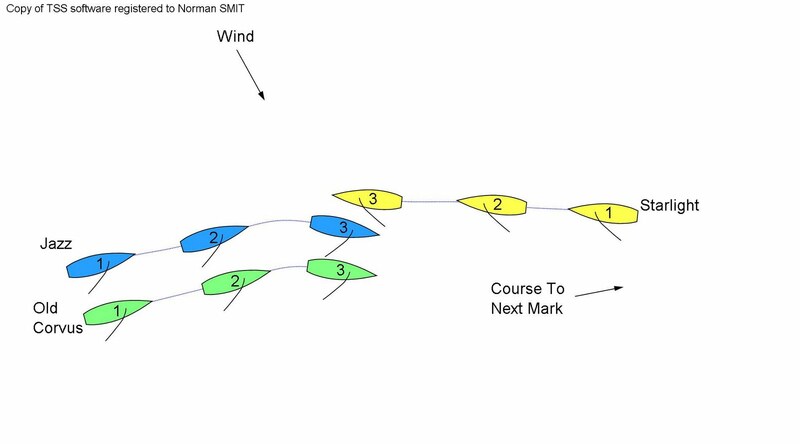 Team racing call E6 (Q2) also refers but these scenarios can occur in fleet races with boats of differing speeds. This is a combination of 2 submissions prepared by the ISAF Section C Working Party. It is integral with the submission to change the definition Mark-Room. (c) the obstruction is a mark and a boat that is fetching it would be required to respond and change course. (a) After a boat hails, she shall give the hailed boat time to respond. (b) The hailed boat shall respond even if the hail breaks rule 20.1. (c) The hailed boat shall respond either by tacking as soon as possible, or by immediately replying ‘You tack’ and then giving the hailing boat room to tack and avoid her. (d) When the hailed boat responds, the hailing boat shall tack as soon as possible. When a boat is taking room to which she is entitled under rule 20.2(c), she shall be exonerated if she breaks a rule of Section A or rule 15 or 16 with respect to the hailed boat. Rule 20 has received less attention in previous rules cycles than the other rules of Section C. This proposal is the result of an extensive discussion and submissions in 2010, followed by revisions in 2011 to respond to input from the Racing Rules Committee, the Section C Working Party, and others. then returns to restrictions on hailing in its final section. The proposed rule has been reorganized into a more logical structure. The first section brings together the requirements and restrictions for a boat hailing for room to tack. The requirements for responding to the hail are together in the next section. Passing on a hail to a third boat is covered in its own section, and the rule concludes with a section on exoneration. This structure will make the rule easier to learn and use and more straightforward to cite in decisions. The proposed rule largely and as far as possible retains the wording used in current rule 20. It also adds language to clarify the hailed boat’s obligation to respond and covers multiple-boat situations much more comprehensively than the current rule. when two boats, L and W, approach an obstruction that is also a mark which W is fetching, if L hails for room to tack and W replies “You tack”, L does not break rule 20.1(c) unless W needs to make a course change to give L the room she has requested. Under the current rule, L would be penalized even if W has to make no change of course. 2. Rule 20.2(b), requiring response to a hail, was, in the 2010 proposal, less logically located at the end of rule 20.2. 3. The 2010 proposal contained a stand-alone sentence at the end of rule 20.1 permitting a boat, once she has been hailed for room to tack, to “pass on” the hail to another boat when she herself needs room to tack. In this proposal this issue is handled in a separate new section, rule 20.3. This change was made for two reasons. First, these situations are less common; moving them out of rule 20.1 simplifies the narrative of the rule, making it easier to understand and learn. Second, it is important for safety that such a “middle” boat is free to hail without risking a penalty for violating the normal restrictions on hailing contained in rule 20.1. It is easier to give relief from these restrictions in a separate sub-rule than in the rule containing the restrictions. Proposed rule 20.1 is constructed from parts of current rules 20.1 and 20.3, using almost identical wording. It makes clear when a boat may hail. Proposed rule 20.2 follows current rules 20.1 (a), (b), and (c), with virtually unchanged wording. It takes the reader step-by-step through the sequence of events following a hail. Rule 20.2(b) has no equivalent in the current rule. It adds an important safety feature by making it clear that the hailed boat must respond when she has been hailed under either rule 20.1 or rule 20.3, even if the hailing boat does not qualify to hail under those rules. This avoids dangerous disagreements on the water, in situations where delay can result in damage or injury. The hailed boat must respond; her remedy for an improper hail is to protest. This change embodies a principle expressed in Match Race Call MR 38 and in Team Race Call B7. 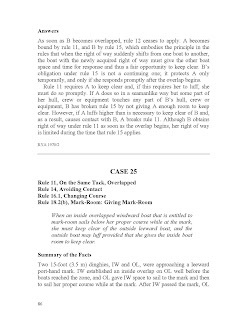 Proposed rule 20.3 handles hailing in multiple-boat rule 20 situations, as described above in the section on changes from the 2010 submission. Proposed rule 20.4, Exoneration, is very similar to current rule 20.2. It adds the words 'with respect to the hailed boat' at the end. This restriction limits exoneration so that it is only available for interactions between the hailing boat and the hailed boat. The current rule can be read as permitting exoneration for breaking a rule with respect to a third boat that just happens to be close by but is not involved in the rule 20 interaction. Here are some examples of the numerous multiple-boat situations which are not well resolved by the current rule but would be handled by the proposed rule. In each, the middle boat is in an impossible situation, with no safe option that complies with the current rule. Three boats are overlapped approaching an obstruction. The middle and windward boats can fetch the obstruction, but the leeward boat cannot fetch. The leeward boat hails the middle boat for room to tack. Under current rule 20, if the middle boat hails the windward boat for room to tack in order to comply with her obligation to the leeward boat, she would break rule 20.3. Three boats are overlapped approaching an obstruction. The leeward boat hails for room to tack. The middle boat is sailing below close-hauled. Again, if she passes on the hail to the windward boat, she will break the first sentence of current rule 20. Note that the proposed rule is consistent with the conclusions of a recent Case (Case 113); all boats that can hear a hail of room to tack and need to respond must do so, but that does not relieve intervening boats of the obligation to pass on the hail. Well these were the most significant changes that I found in sifting through the submissions to ISAF for the next cycle. They will vote in November as to which will be incorporated in the new rule book. Any comments?. 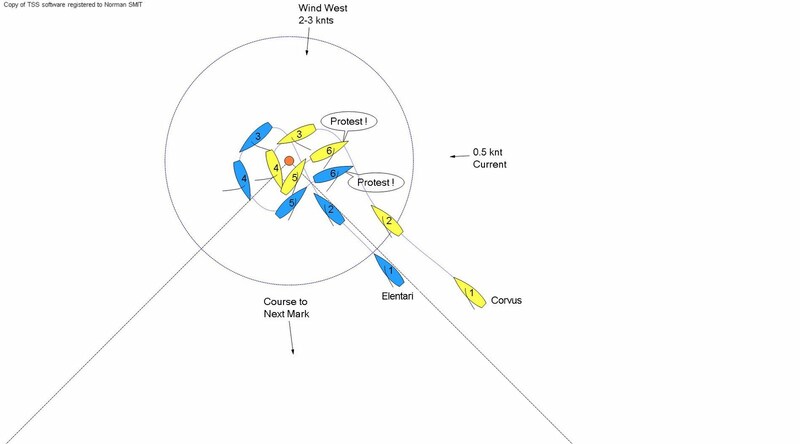 The wind was light (2-3 knots) and had shifted to the right so that the race became a reach to the windward mark and then a reach back to the finish. As Jazz approached Starlight at position 3 she changed course to leeward to clear Starlight's boom. Old Corvus altered course to avoid Jazz and protested Jazz for not keeping clear. In addition, Old Corvus said Jazz changed course without hailing him and he wouldn't have had to change course to clear Starlight's stern. There was no contact between Jazz and Starlight or Jazz and Corvus. Decision: No rule was broken. Starlight on Starboard tack is an obstruction by the definition because both Old Corvus and Jazz must keep clear of her. Although Old Corvus can keep clear without altering her course, by rule 19(b) she must also give room to Jazz to clear the obstruction once she has decided, as right of way boat, which side she will pass the obstruction. Finally, Jazz is not required by the rule to hail Old Corvus for room at the obstruction. It is perhaps a prudent thing to do, but it is not required by the rule and Jazz does not break a rule by not hailing to Old Corvus for room. Protest of Elentari (bow #18) by Corvus (bow #33) first leg in Race 4 of the BISF Second Summer Series Night 1 on July 11, 2011 . Elentari entered the zone at the windward mark clear ahead of Corvus. Elentari was just below the starboard tack lay line, and Couvus had slightly over stood. At the mark Elantari headed above close hauled to clear the mark and there was approximately ¾ of a boat length between Elentari and the mark as she rounded the mark (position 3). Corvus moving faster than Elentari obtained a late overlap inside at the mark and both boats gybed to port tack (position 4). Elentari luffed Corvus and Corvus promptly responded to the luff up to or slightly above close hauled between positions 4 and 5. There was no contact between the two boats, or between Corvus and the mark. Rule 11- On The Same Tack, Overlapped; Rule 12-On The Same Tack, Not Overlapped; Rule 16-Changing Course; Rule 18-Giving Mark Room. When Elentari entered the zone clear ahead she was entitled to mark room by rule 18.2(b), which includes room to sail to the mark and then room to sail her proper course while at the mark. In this case when Elentari rounded the mark at position 3 she left approximately ¾ boat lengths between her and the mark and her proper course at this time was to sail to the next mark at position 4. 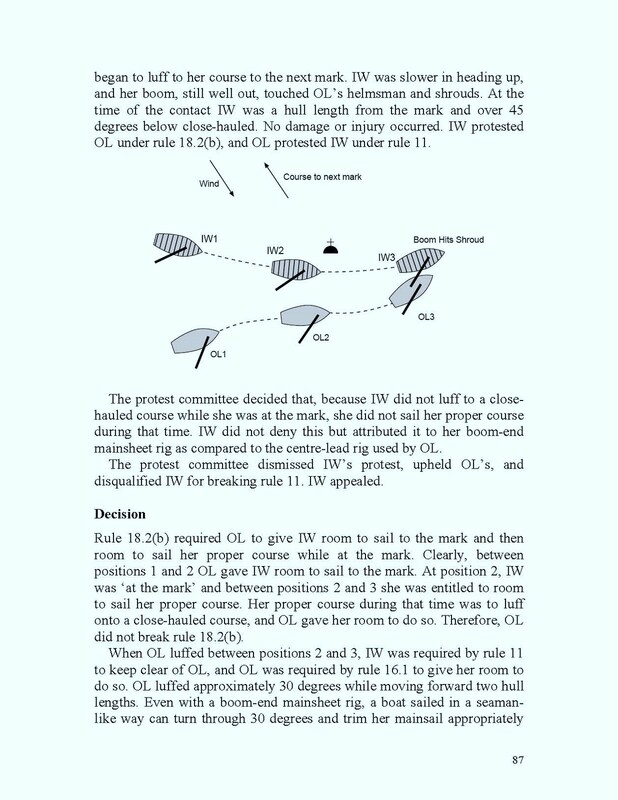 When Corvus obtained the inside overlap at position 3 and gybed to port at position 4, she provided adequate room for Elentari to sail her proper course while Elentari was at the mark, and thereby complied with rule 18.2(b). Between position 3 and 4 Elentari changed course to above her proper course, and provided Corvus adequate room to keep clear while she changed course as required by rule 16.1. Corvus kept clear as required by rule 11. No rule was broken and the protest is dismissed. There was no protest filed but Yellow asked my opinion as to what rules apply. Clearly the rule that applies is rule 10 that a boat on a port-tack must keep clear of a starboard-tack boat. The question is if Blue can be penalized for breaking the rule. To determine this lets look at the preamble to the rules of Part 2 which says. "The rules of Part 2 apply between boats that are sailing in or near the racing area and intend to race, are racing, or have been racing. However, a boat not racing shall not be penalized for breaking one of these rules, except rule 23.1." The rules apply if you are in the racing area and intend, are, or have been racing, but you can only be penalized only if you are "racing". We need to go to the definition of racing to determine if Blue can be penalized. The following is the definition of racing. "A boat is racing from her preparatory signal until she finishes and clears the finishing line and marks...."
So, although Blue has finished at position 2 she is still racing because she hasn't cleared the finish line yet, and should be penalized. However, if Yellow is forced to alter course after Blue has cleared the finish line, then although Blue breaks rule 10 she cannot be penalized because she is not racing. The Appeal of Sugar Magnolia is now decided. Pardon the date from last year on this post, but I pulled the original post at the request of PIYA until it was decided by US Sailing and now it has.. This post is to provide an update of the appeal and show how it was finally decided. To start with the appeal was lost for a period of months after it was filed. Because Sugar Magnolia filed two appeals for the same race involving the same two boats, US SAILING thought it was the same appeal sent twice. We asked the status of the second appeal after the first had been decided by PYIA and found out PYIA AC was never was sent the second appeal by US SAILING. The appeal that was lost was the appeal posted in my previous post Show time vs Sugar Magnolia. At first blush it seemed to be a rather easy appeal to decide, but there were several question asked by the PYIA AC that indicated they were struggling with the decision because we never found as fact whether Sugar Magnolia sailed her proper course after she passed the leeward mark boat. What follows is the correspondence between the PC and the PYIA-AC and the final decision by US SAILING. Below is a letter from the PYIA AC with questions and the responses from the PC in italics. In addition, you will see some clarifications on the diagram requested by the AC. 1. After SM rounded the leeward mark, was the next leg of the Race a beat to windward or a free leg of the course? If the latter, please indicate on the PC's diagram the direction of the course to the next mark. PC Response – This was a leeward mark, and the next mark was to windward. 2. Please show on the PC's diagram what SM's proper course – in the prevailing wind, sea state and current conditions – would have been (not necessarily the course she actually sailed) from the time that her bow was abreast of the leeward mark until SM would have accelerated up to speed on her course to the next mark. SM's proper course to the next mark would depend on whether or not the next leg of the Race was a beat to windward. PC Response – We have modified the diagram to show the direction of the wind and the direction to the next mark. The next leg was a beat to windward so proper course was close hauled. We have added an arrow to the diagram showing the close hauled course for SM. However, we didn’t find as fact whether SM was sailing her proper course or not between positions 5 and 6 only that she was below close hauled. We didn’t consider her to be “at the mark" when she broke rule 11 so we didn’t consider her proper course to be relevant to the decision. We could reopen the hearing to determine if it was her proper course, but our decision would be unchanged. 3. Did SM have her dagger board fully lowered by the time SM was at the leeward mark and began altering course to windward while rounding the mark? PC Response – We do not know if her dagger board was fully lowered. The status of the center board was not a fact found. 4. What was the nature and extent of the damage to each of SM and ST? Please reply to the foregoing questions and send the PC's amended diagram, to the PIYA-AC as well as both parties to the Protest, at your earliest convenience. Thank you for providing us with some additional information and with a revised diagram in response to our letter to your of Oct. 14, 2010. When SM entered the zone overlapped inside ST, ST was required by rule 18.2(b) to give SM mark room (defined terms in italics). One of the fundamental issues involved in this Appeal is for how long rule 18 applied during the period of time from when SM had passed the leeward mark – the stern of the RC signal boat – until the moment of contact between SM and ST. Per the definition of mark room, SM was entitled to sail her proper course while SM was "at the mark." In our opinion, unlike how rule 18 applied prior to 2009, under the current rule a boat is "at the mark" from the moment in time when her bow is first alongside the mark until she is sailing on her proper course (in this incident, close hauled on port tack) to the next mark. This means that, at a leeward mark when the next leg is a beat to windward, a boat is still "at the mark" while completing a proper course rounding from her previously offwind course until she is on a close hauled course to the next mark, which for most keelboats would be a period of time beyond when she would have left the leeward mark astern. Acting under rule F6, Inadequate Facts; Reopening, we are writing to ask that you provide the following additional facts. Please show on the your diagram of the incident what SM's proper course – in the prevailing wind, sea state and current conditions – was (not necessarily the course SM actually sailed) from position 3 until SM was no longer in the zone. According to the materials you have provided to us, the only other boat involved in this incident was ST. Therefore, what we are requesting is an addition to your diagram showing the course that SM would have sailed (from position 3 until she was no longer in the zone) to finish as soon as possible in the absence of ST. We expect that this will necessitate your reopening the protest hearing, to take additional testimony in order to be able to find additional facts, so as to provide this information. After you have concluded the reopened hearing, please send the PC's additional findings, amended diagram and conclusions to the PIYA AC as well as both parties to the Protest, at your earliest convenience. Thank you for your help with this matter. SM rounded up to just below close hauled at position 5 and sailed below close hauled between positions 5 and 6 to gain speed and would have sailed this course in the absence of ST to finish as soon as possible, making it her proper course. The course shown in the diagram provided previously was found to be her proper course so I did not resend it. Our conclusion is that SM should be DSQ regardless of if she was sailing her proper course from position 5 to 6. SM is required by rule 11 to keep clear throughout the rounding, but does not. The question is if she can be exonerated by rule 18.5 for breaking rule 11 because she is still “at the mark” and entitled to mark-room. We do not consider her “at the mark” when she breaks rule 11 because the mark is no longer influencing the course she is sailing from position 5 to 6. She has rounded the mark at position 5 and is sailing low to gain speed to position 6, which has nothing to do with the mark. Rule 11 requires her to keep clear so she is not entitled to sail her proper course from position 5 to 6, but must keep clear. ST gave SM room to sail her proper course “at the mark” when she was in position 5 and as right of way boat changed course in compliance with rule 16.1. SM did not respond to the change in course by ST and took room to which she was not entitled from position 5 to 6. If you decide ST broke 18.2(b) for not providing mark-room, we would then ask you to consider if it was reasonably possible for SM to avoid contact as required by rule 14 once it was clear that ST was not providing mark-room. If it was reasonably possible and there is damage, then she should be penalized since rule 18.5 does not allow exoneration for breaking rule 14. If the facts we found do not convince you that SM broke rule 14, then again the decision should be overturned. We decided not to challenge the assertion in the protest by SM that she was sailing her proper course throughout the rounding. The parties were not close to agreement as to if SM made a seaman like rounding, or was below her proper course. In any case we didn't believe they were "at the mark" when the foul occurred, so it didn't matter. Also, in reviewing the ISAF Cases and US SAILING Appeals, the boat entitled to mark room was generally sailing below her proper course after the rounding, making the decision obvious. There is no case that tells us when is a boat was no longer "at the mark" after a mark rounding. The PYIA-AC seemed to be saying in their letter of November 23rd that a boat's proper course during the rounding defined and extended the period when a boat is "at the mark". If this is true, then when can a right of way boat begin to take a boat above her proper course after rounding the mark needed to be clarified by way of an appeal. PYIA-AC overturned our decision and found the SM was entitled to mark room and also found that SM did not break rule 14 so they reinstated SM. However, they forwarded the decision to US Sailing for them to review since they were concerned with the result. PIYA-AC requested that I not publish their decision as they believe that only final decision of US Sailing is relevant and I want to respect their request. March 29, 2011 US SAILING completed their review of the appeal and the following is the text of their decision. This is the US SAILING Appeals Committee’s decision on the Pacific International Yachting Association (PIYA) Appeals Committee’s request for confirmation or correction of its decision on the protest Sugar Magnolia vs. Showtime, arising from an incident in Race 3 of the South Sound Sailing Society First Wednesday Night Series on June 16, 2010, conducted by the South Sound Sailing Society. held that right at the time of the contact between her and Showtime. Rule 18 applied as long as at least one of them was in the zone. Rule 18.2(b) required Showtime to give Sugar Magnolia mark-room as soon as Sugar Magnolia reached the zone. However, the definition Mark-Room introduces another consideration. After Sugar Magnolia had finished sailing “to” the mark, and was “at” the mark, she was entitled to “room to sail her proper course,” the course she would have sailed to finish as soon as possible in the absence of Showtime. The critical question in this case is whether Sugar Magnolia was still “at” the mark when the contact occurred. In our judgment she was beyond the mark, not “at” it. Between positions 5 and 6 she had left the nearest part of the mark vessel astern, and the mark was no longer relevant to her course to the next mark. As the protest committee chairman commented, “We do not consider [Sugar Magnolia to be] at the mark when she breaks rule 11 because the mark is no longer influencing the course she is sailing from position 5 to 6.” We agree. At the time of the contact between the boats, the only rules of consequence were rules 11 and 14. (Although rule 18.2(b) still applied, it did not specify any rights or obligations after Sugar Magnolia was no longer at the mark.) Rule 11 required Sugar Magnolia to keep clear of Showtime but she failed to do so. She would have been entitled to exoneration under rule 18.5(a) had she been taking markroom, but she was not; therefore she is not exonerated from breaking rule 11. Had Sugar Magnolia been unable to keep clear of Showtime immediately after she was no longer at the mark, that could have been evidence that Showtime failed to provide mark-room, but in this case Sugar Magnolia could have kept clear of Showtime after she was no longer at the mark. Concerning rule 14, Sugar Magnolia was required to avoid the contact “if reasonably possible.” She could have kept clear of Showtime after she was beyond the mark. Furthermore, she had been hailed by Showtime at position 5 and must have been aware that the boats’ courses were converging. She therefore had enough time and space to change course and avoid the collision, but failed to act soon enough, so broke rule 14. Showtime also broke rule 14. Although rule 14(a) provided that she did not need to act to avoid Sugar Magnolia until it was “clear” that Sugar Magnolia was not keeping clear, that fact had been evident for some time because Sugar Magnolia was not changing course as Showtime approached. In summary, Sugar Magnolia broke rules 11and 14, and Showtime broke rule 14. Accordingly, the appeal of Sugar Magnolia is denied, and the decision of the protest committee to disqualify both boats is upheld. Some Appeals Committee decisions are published in the US SAILING Appeals Book because of their educational value. They may be simplified or otherwise modified, and the version to be published is sent to the parties and committee chairmen involved. This incident took place approximately 9 months ago and is now finally decided. It has been an interesting process and an interesting discussion of the mark room rule and when is a boat "at" a mark. Perhaps in the near future there will be a new published appeal using this incident. from a Wednesday night race in Budd Inlet. South Sound Sailing Society - First Wednesday Series Race 3 on June 16, 2010. Leeward mark at the end of the second lap. 1. Wind was from Southwest at 5-8 knots. 2. The leeward mark was the RC boat to be left to port. 3. Showtime is an Olsen 25, 25 feet long and Sugar Magnolia is an S2 7.9, 26 feet long. 4. Sugar Magnolia reached the zone first, inside Showtime and on starboard tack; Showtime was on port tack (position 1). 5. Sugar Magnolia gybed to port tack and was sailing lower and slower than Showtime. Sugar Magnolia was sailing at approximately 3 knots and Showtime was sailing at approximately 4 knots approaching the leeward mark (position 3). 6. Sugar Magnolia was approximately 5 feet from the RC as she passed the stern of the RC boat and Showtime was approximately 10 feet to leeward of Sugar Magnolia (position 4). 7. 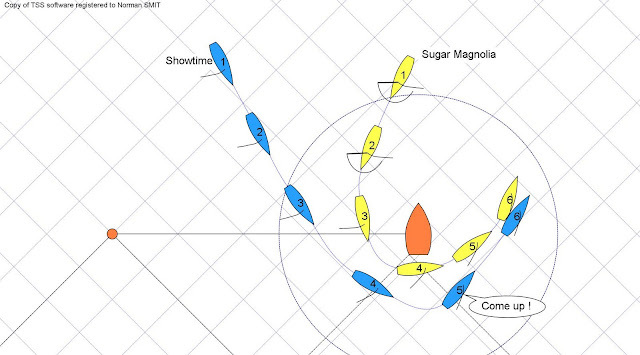 After Sugar Magnolia passed the stern of the committee she rounded up to just below close hauled and her sails were not completely set for a close hauled course (position 5). 8. Showtime rounded up to close hauled and was on a converging course with Sugar Magnolia and she hailed Sugar Magnolia to come up (position 5 to 6). 9. Approximately 15-20 seconds after Sugar Magnolia passed the stern of the RC boat and at approximately 2 boat lengths from the mark, Sugar Magnolia headed up to close hauled and her stern struck the side of Showtime (position 6). 10. There was damage to Showtime at the point of contact. 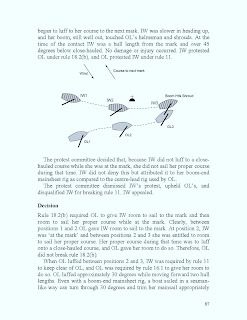 Rule 11, On the Same Tack, Overlapped; Rule 14, Avoiding Contact; Rule 16, Changing Course; and Rule 18.2, Giving Mark Room; Applicable case, ISAF Case 25. 1. By rule 18.2 Sugar Magnolia was entitled to mark-room. Based on the distance between Sugar Magnolia and the stern of the RC and between Showtime and Sugar Magnolia, adequate space was provided for a seaman like rounding in the prevailing conditions. Therefore, Showtime fulfilled her obligation to provide mark-room. 2. After passing the mark and Showtime changed course to close hauled the boats traveled approximately 2 boat lengths in 15-20 seconds as the gap between the boats was reduced from approximately 10 feet to 1 foot. Therefore, Showtime provided adequate room for Sugar Magnolia to keep clear in accordance with rule 16. 3. Sugar Magnolia as the windward boat did not keep clear as required by rule 11. 4. It was reasonably possible for Sugar Magnolia to have avoided contact if she would have responded sooner to Showtime’s change in course to close hauled. 5. It was reasonably possible for Showtime to have avoided contact if she would have born away when it was clear that Sugar Magnolia was not keeping clear. Sugar Magnolia broke rules 11 and 14 and is disqualified from Race 3 in the First Wednesday Series in accordance with rule 64.1(a). Showtime broke rule 14, and because there was damage, is disqualified from Race 3 in the First Wednesday Series in accordance with rule 64.1(a). The Protest was appealed and it is pending a decision. The following is the appeal submitted to US Sailing by Sugar Magnolia. I wish to appeal the decision in the Protest Sugar Magnolia vs. Showtime South Sound Sailing Society ­First Wednesday Series Race 3 on June 16, 2010. Leeward mark at the end of the second lap. I am appealing because the protest committee did not apply rule 18 correctly. That satisfies only half of Showtime’s obligation, giving room to sail to the mark. The committee seems unaware that mark room is not only room to sail to the mark, but also room to sail one’s proper course at the mark (the definition of mark room). To determine if rule 18 was violated we also need to know, Was Sugar Magnolia given room to sail her proper course at the mark? However the committee does not address this question. This is clearly a mistake. No one can know that rule 18 was satisfied if they do not know if the inside boat was allowed to sail her proper course at the mark. The committee’s failure to address this pivotal question led them to misapply rule 18 and judge the protest on rules that did not govern. The diagram clearly shows that both boats were in the zone at the time of contact. The finding of facts tells us they were two lengths from the mark. 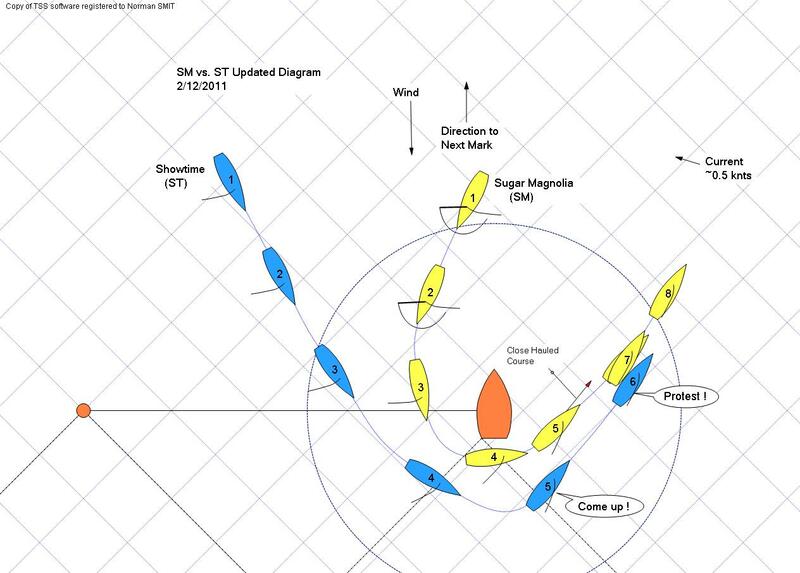 ISAF Case 2 tells us “Rule 18.2(a) applies … while boats are overlapped and at least one of them is in the zone.”. So rule 18 applied as they were “at the mark”. The committee found that Sugar Magnolia did luff up to closehauled. They tell us she went from beam reaching at the stern of the mark boat to close hauled in 15­20 seconds and two lengths. That is her proper course as defined in Case 25. Look at the diagram provided by this protest committee. You see the classic “U” turn around the mark: a course to round as fast as possible (only the mark is too close to the bottom of the turn). That is her proper course. Clearly Sugar Magnolia was sailing her proper course at the mark, as was her right under rule 18. 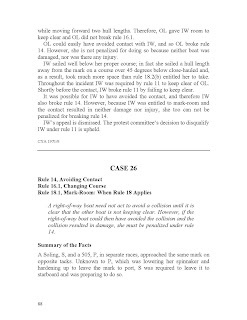 The collision demonstrates that Showtime did not give her room at the mark, in violation of rule 18. Sugar Magnolia was exercising her rights under rule 18, and so did not violate rule 11. As Sugar Magnolia was fouled, her obligation under rule 14 was different than the committee thought. As a boat required to keep clear under rule 11, she would have been required to take action well before the collision was immanent. 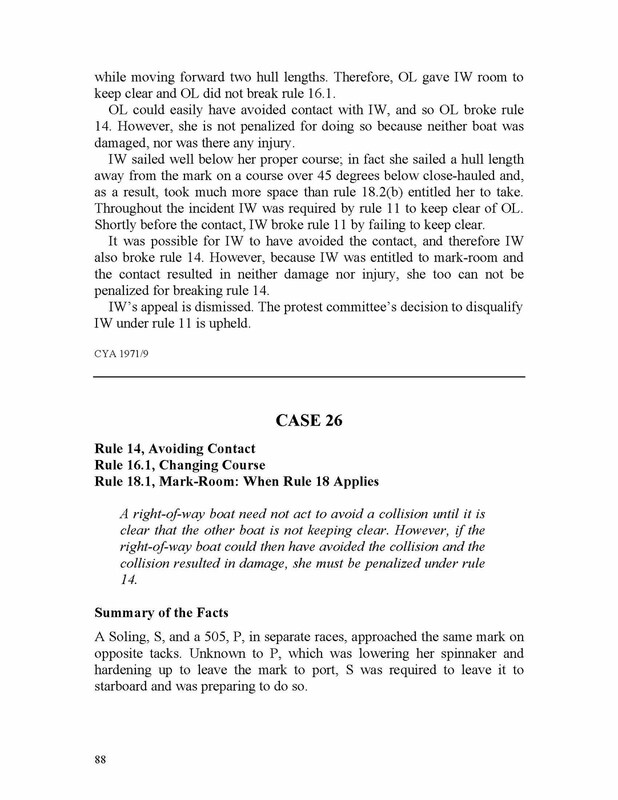 As a boat with a right to sail her proper course under rule 18 and doing so, she is not required to take action to avoid a collision until it is apparent that the fouling boat was not going to. This means she had considerably less time to take avoiding action than the committee credited her with. This clearly assumes that Sugar Magnolia was obligated to take action when Showtime first changed course, which we now know was not the case. They say her mistake was in not taking action earlier than, we now know, she was required to. The implication of point 4 is that once it became apparent that a collision was immanent, at the point she was required to act, it was too late for Sugar Magnolia to have avoided it. The committee’s findings of fact show that Sugar Magnolia was trying to avoid the collision, by turning to weather, away from Showtime. One is only required to make a reasonable attempt to avoid the collision; turning away from a boat charging at one is a reasonable attempt. Showtime should be found in violation of rule 18 Sugar Magnolia should be exonerated and reinstated. Case 25 is an example of a boat sailing below her proper course. 1.the importance of the fact that she was sailing below her proper course. That was the first issue addressed, as the out come would have been different had she been on her proper course. 2. Sugar Magnolia sailed a very different course than the boat in Case 25. This is obvious by comparing the diagrams. Two lengths from the mark the boat in Case 25 had not come up even 30 degrees; at two lengths Sugar Magnolia was closehauled and on her proper course. How do you think this will be decided by the appeals committee? Did the PC not properly interpret rule 18? I've attached Case 25 which was referenced in both the decision and the appeal.